Earlier this month Wyoming regulators reached a deal with Arch Coal to accept up to $75 million in place of the company's $486 million in bonding obligations while the company goes through Chapter 11 bankruptcy. 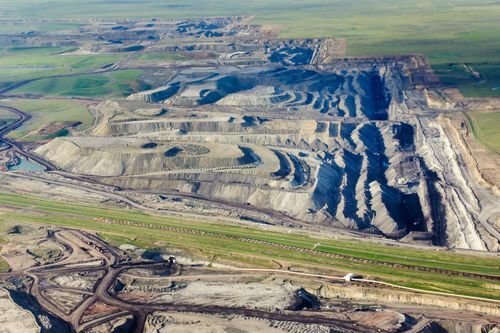 As discussed in an earlier post, coal companies are typically required to post a bond to ensure that the lands they mine can be cleaned up and restored to their pre-mining state. However, some states, including Wyoming, have historically allowed coal operators to "self-bond," which means that coal companies could demonstrate their ability to satisfy their future reclamation requirements based on their existing assets at that time. In other words, states offering this deal haven't required actual collateral from companies deemed to be in good financial health at the time they were required to post a bond. Here's the problem - the practice of self-bonding doesn't account for what happens when a once financially healthy company tanks. This most recent deal between Wyoming and Arch covers only 19% of the bankrupt company's nearly $500 million reclamation bill. By not requiring Arch to post collateral for the full extent of its reclamation costs, the company will supposedly be able to continue operating (and simultaneously fulfilling their reclamation obligations) throughout the Chapter 11 proceedings. While Arch seems confident that the restructuring will set the company up for long-term success, there is much uncertainty regarding the implications of the bankruptcy on Arch's reclamation responsibilities for their existing surface mines. With a similar deal being struck with another coal industry giant at the end of last year, the fact is that as these companies declare bankruptcy, it becomes less and less likely that they will be able (or required) to pay to clean up after themselves. Twenty-six coal companies have declared bankruptcy over the last few years--with Alpha, Patriot, and Arch being some of the most well-known on the list. The reality is that only about 10% of mines eligible for reclamation across Western states have actually successfully completed the process, and that leaves a lot to be desired - and nearly 400 square miles to be restored. Cleanup wasn't occurring at the pace it was meant to when these companies were in good financial health, so what's to be expected in the face of an industry collapse? Alarmingly, despite the fact that existing mined lands aren't being restored, the amount of mined land continues to increase. In a Senate Energy and Natural Resources Committee hearing this week, U.S. Senator Maria Cantwell raised an important issue as part of her push to the Interior Department to end the practice of self-bonding: "And how are we making sure that the taxpayer isn't left on the hook [for reclamation work by bankrupt companies]? Do you think self-bonding is working? Does it present a problem and a risk to the taxpayer?" Following the hearing, U.S. Interior Secretary Sally Jewell said that federal officials are committed to shielding taxpayers from self-bonding liabilities. Secretary Jewell specifically noted that "[e]ven at a time of financial distress, it is still the responsibilities of these companies to do the reclamation that they signed up for. We need to make sure that those companies are held accountable." But lack of reclamation isn't just a potential problem for taxpayers. A recent NRDC and National Wildlife Federation report focused on the impacts of energy development on wildlife and hunting opportunities in southeastern Montana and Northeastern Wyoming found that coal mining can degrade and destroy wildlife habitat, threatening various wildlife species as well as the associated tourism and hunting industries (about $7 billion dollars in MT and WY). Additionally, a reclamation report released last year by NRDC, Western Organization of Research Councils, and National Wildlife Federation found that lack of reclamation poses a threat to Western water, a precious, and sometimes scarce, natural resource in the arid West. So, while Wyoming officials claim that the Arch deal is a win for the state, it certainly seems like a loss for taxpayers, wildlife, and our environment. And, unfortunately, the situation is likely to only get worse, as market signals are flashing warning signs that Peabody Coal - which owns three mines in Wyoming, including the largest coal mine in America, the North Antelope Rochelle Mine - will be the next coal giant to seek bankruptcy protection. It's time to end the practice of self-bonding once and for all, while taking steps to guarantee coal companies abide by their legal obligation to restore and reclaim lands torn apart by mining.